Zinc serves two broad functions: enzyme function and protein synthesis. Dogs need zinc for healthy coats and for normal pigmentation of the coat hair. 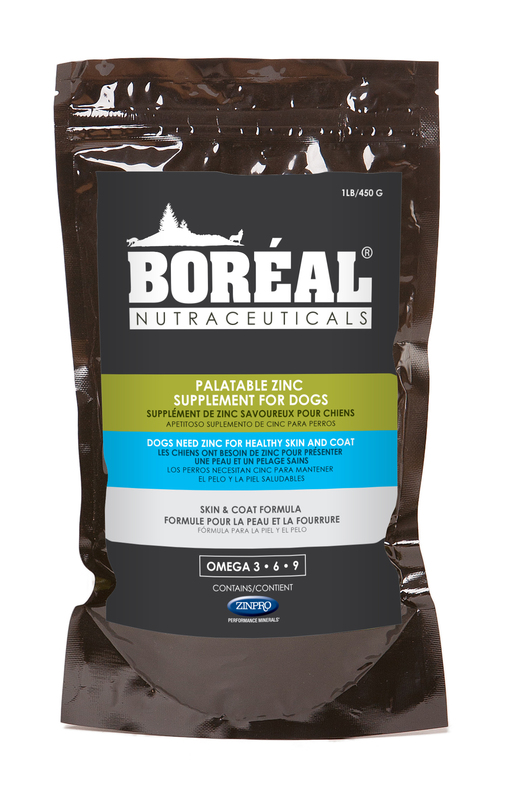 Boréal Palatable Zinc Supplement For Dogs contains ZINPRO® 180 from Zinpro Performance Minerals®, a patented organic source of zinc for animals, made by linking the amino acid methionine with zinc to form a structure that can be absorbed directly into the bloodstream. ZINPRO® (zinc methionine complex) is a nutritional feed ingredient for animals that contains organic zinc. The trace mineral zinc is required by animals for numerous functions including: immunity, reproduction, skin and hoof integrity, muscle development, milk production and eggshell quality. In addition, when an animal has the proper balance of organic trace minerals it is better able to cope with the challenging effects of stress. ZINPRO, from Zinpro Performance Minerals®, is built on a unique, patented molecule that consists of one metal ion bound to one amino acid ion – called a metal specific amino acid complex. Zinpro Performance Minerals are the most bioavailable trace minerals on the market, which means more of the minerals are absorbed by the animal to deliver their full benefit. For 45 years, Zinpro Performance Minerals have delivered positive animal performance responses and a strong return on investment in operations around the world. Feeding Directions: Feed 1 level tablespoon (approximately 10 gms) per 50 lb (22 kg) of body weight daily. This should be top-dressed or mixed with food daily. For larger breeds, give multiples of 1 tablespoon per 50 lb (22 kg) of body weight daily. The above doses achieve a dose rate of approximately 15-20 mg of elemental zinc from zinc methionine per 20 lb (10 kg) of dog. With the advice of your veterinarian, feed Boréal Zinc Supplement at double the above dosage for the initial 28 days or during periods of stress. Brewers Yeast, Menhaden Fish Meal, Flaxseed, Palm Oil, Zinc Methionine, Garlic Powder, Vitamin E Supplement, Biotin Supplement.